Stunning solid oak wardrobes with lots of storage space. Large hanging areas and drawers for hidden storage. All with real dovetail joints on the drawers. 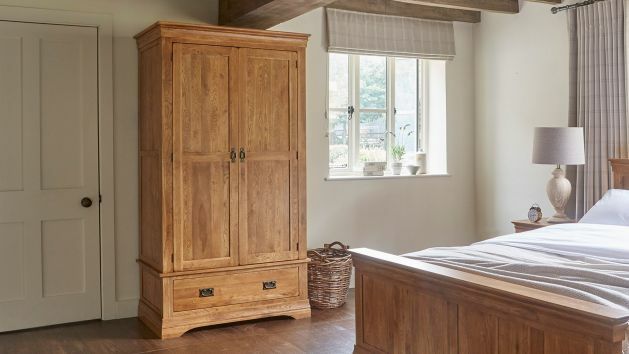 We have a fantastic selection of solid oak wardrobes, each specially made to combine the best of style and storage. Our designers have created looks which span from the more traditional, to the modern and simple, so you know you will always find the ideal piece for your bedroom. Each wardrobe boasts large hanging areas, perfect for keeping your clothes looking their best. Underneath, deep drawer storage provides a great hidden storage space, ideal for linens, handbags, or other bedroom necessities. The drawer has real dovetail joints for strength and durability, and the bases, backs, and runners are also made from solid oak, extending our high quality standards throughout the unit. We have complemented each style with matching hardware, and our rustic and natural finishes to create stunning furniture for you home. Browse all our oak wardrobes below!